Originally published under the title, "Stanford 'Charlie Hebdo' Panel: Je Suis Ferguson?" 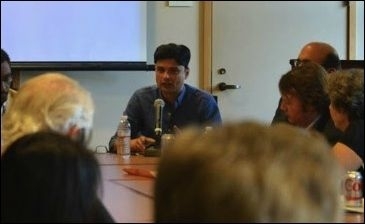 Stanford Islamic studies professor Shahzad Bashir convenes the "Terror, Freedom, Blasphemy" panel discussion. What does the Islamic terrorist attack on the French satirical magazine Charlie Hebdo in January have to do with the 2014 police shootings of African-American men in Ferguson, Missouri and Long Island, New York; San Francisco's troubled Bayview-Hunters Point neighborhood; and the Occupy Wall Street movement? 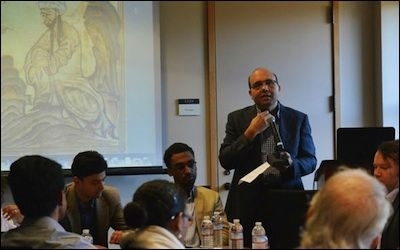 A recent panel discussion at Stanford University, "Terror, Freedom, Blasphemy: Reflections on Citizenship in Our Times," used the connection between the struggles—both real and imagined—of minorities in the U.S. and those attributed to Muslims worldwide to deflect attention from Islamic radicalism in the West. Sponsored by the Sohaib and Sara Abbasi Program in Islamic Studies, the afternoon discussion took place in a Center for International Security and Cooperation conference room with a long, narrow table in the middle, at the head of which sat the panelists. Approximately forty people—a mixture of students and locals, many of them eating lunch—were seated at and around the table, some spilling out into the hallway. Framed posters lined the walls with slogans such as, "China Builds the Bomb" and "International Arms Control," but none spoke to Iran's highly-contested efforts to build a nuclear weapon. The idea for this event came from a discussion between myself and [fellow panelists] Robert Crews, [and] Aishwary Kumar, and grew out of a general frustration about the state of the world. [T]he torture information that came out of the U.S. Senate; what's happening in Iraq and Syria; what's happening in Ferguson, Missouri and Long Island; events in Nigeria, and what happened in Paris most recently. . . . We wanted an occasion where we could draw the connections between these events. I want to use this as an opportunity to think about the troubling connections between the enactment of citizenship and the structural violence against the African-American community of the Hunters Point neighborhood [in San Francisco] after WWII. He thanked co-panelist Robert Crews, history professor and director of the Sohaib and Sara Abbasi Program in Islamic Studies, for "reaching out" to him. Later, Bashir ratcheted up the absurdity by directing an audience question about the European migration of jihadists to Jenkins, who responded, predictably, by discussing Hunters Point. 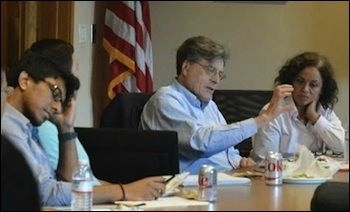 Stanford history professor Robert Crews charged the American government with "the fetishistic abuse of brown and black, Arab and African bodies." Crews began his talk by stating that, "African-Americans are subjected to legal state violence and massive incarceration." Later, he described American foreign policy as "The fetishistic abuse of brown and black, Arab and African bodies" and referred to "Latinos" being "targeted in . . . operations." After stating his intention to "focus first on the American context and its relationship to global militancy,"
Crews detailed an extensive list of grievances against the U.S., including "widespread torture," "Abu Ghraib," "Guantanamo," "solitary confinement," "black sites," "war crimes," "the military justice system," and "films like American Sniper, Lone Survivor, Zero Dark Thirty." The media presents [sic] all the values of Western civilization under vicious assault by the forces of barbarism, savagery, and unreason. Citizens everywhere identified with the slogan "Je Suis Charlie Hebdo." Civilization against the humorless and thin-skinned Muslims who fail to accept the conventions of modern times, citizenship among them. What was the incidence which demanded the presence of global elites? It was perfect for the global media stage. Of the attack's victims or the savagery of mass murder, he said nothing. Aishwary Kumar, who didn't get up, called "the war on terror" a "war against our own depressed psychologies." Aishwary Kumar, an assistant professor of modern South Asian and global intellectual history, opened by citing a European Law Enforcement Agency (Europol) report to allege a low level of Islamic terrorism, concluding that, "the war on terror" is as much "militaristic" as it is "a war against our own depressed psychologies." He then lamented that the huge solidarity march in Paris following the Charlie Hebdo attack was "led by a roster of some of the greatest war criminals you will ever find on the streets . . . there was [British Prime Minister] David Cameron." He excoriated Cameron and the other "war mongering leaders" because, of all things, "None of these leaders came out for Occupy Wall Street." That Cameron and other world leaders would as readily camp-out with the professional agitators of the now-defunct "Occupy" movement as they would join forces against a murderous, global ideology is a farce that only a professor could conjure. [T]here is no freedom without respect. . . . If someone attacks the beliefs of others, that is an assault on his freedom; freedom stops where others begin. "We must not allow hatred to hide behind the excuse of humor," she added, before reaching the asinine and ahistorical conclusion, "Islam has been a great civilization which has been haunted for centuries by populations that were not Muslim." The many non-Muslim victims of Islamic supremacy over the centuries, particularly those today suffering at the genocidal hands of the Islamic State (ISIS), would beg to differ. 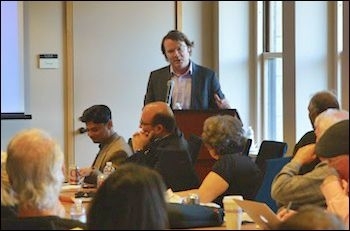 French political scientist Denis Lacorne gave a robust defense of secularism and free speech. French political scientist Denis Lacorne, a then-visiting scholar at Stanford from Sciences Po in Paris, provided the sole exception to the parade of apologetics among the panelists. Lacorne gave a robust defense of secularism and free speech, noting that, "The attack against Charlie Hebdo's cartoons . . . reproduces France of the eighteenth century as if the Enlightenment had not taken place." In reference to French philosopher and playwright Voltaire's 1736 play "Mahomet," which portrayed Islam's prophet Mohammed as a violent fanatic, he asked, "Can we perform today his play? The sad answer is, no we can't. It's too dangerous. No one is going to do it." As proof, he detailed the role of Swiss academic and Oxford University professor of contemporary Islamic studies Tariq Ramadan in preventing the play from being performed in Geneva in the 1990s, noting that it "has not been performed since then." The question and answer period offered few challenges from the audience, with one member pronouncing sycophantically, "what a wonderful event this was" and "how it exemplified the best of Stanford's higher education." A man seated nearby could be overheard making the bizarre claim that former Secretary of State Condoleezza Rice "would have chased everyone here away" were she still teaching "global dominance" at Stanford, but for the heroic "students who protested too much at her classes." In fact, Rice—a senior fellow at Stanford's Hoover Institution, located next door to the building housing the panel—currently teaches at Stanford and she gets high marks from her students for including a variety of viewpoints. For others, however, political diversity is a vice. Despite the panel's stated aim of offering a better understanding of the issues of "terror, freedom, and blasphemy" surrounding the Paris attacks, speakers proffered a cacophony of grievance politics, victimology, and obfuscation. Rather than enlighten, they sought to whitewash. It was just what we've come to expect from the "experts" filling the ranks of Middle East studies.